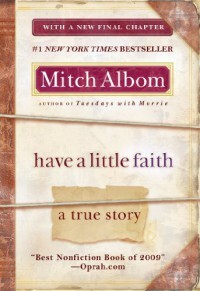 This book is the true story of Mitch Albom's journey in discovering faith after being asked by his rabbi to eulogize him at his funeral. The story beautifully intertwines the stories of Albom's own life, that of his rabbi's and the pastor of a congregation of homeless people in urban Detroit-- the combination of which provides the reader with a wonderfully written account of the author's journey of discovery. I would recommend this book to people of all faiths and beliefs, including those who do not.